Where's my Apple underwear? I'm dead serious. Where’s my Apple underwear? I’m dead serious. I’m a sucker for Apple products and I’m proud of it. Yes, they are more expensive, you pay for the brand and yes, I have a secret crush on Steve Jobs. I don’t care, I admit it, I’m not ashamed. The thing is: I like Apple, and adore Steve, because they don’t let me down. They never do. Whatever I buy always works, smells good and looks good. Some geeks will say that looks and design don’t matter in a computer. All it should do is perform. I’m sure that is a valid argument for some people. Those same people must also buy the cheapest clothes (“as long as they are comfortable”), drive an ugly car (“as long as it gets me to where I’m going”) and just blend their food before serving it (“who cares what it looks like, it is food”). Admittedly I’m not one of those people. I love good design, spend money on clothes and good food and appreciate a nice car. I stare at my computer more than I see my kids and wife (who I all find very pretty too) so yes, I’m paying a premium for good looks, and it is worth it. Recently I bought the Apple Battery Charger. It arrived at the office and my partners unwrapped it before I got there because they wondered what I had bought. Then they had a lot of fun over the fact that I had paid €25 for a battery charger with an Apple logo on it. A regular charger costs less than €10. I know that because I already own one. It sits on my desk, unused. I understand their thinking, I really do. But the reality is that if Apple releases a battery charger I know in advance it will be better than any other battery charger on the market. If Apple releases a phone it changes the industry and sets a new standard. 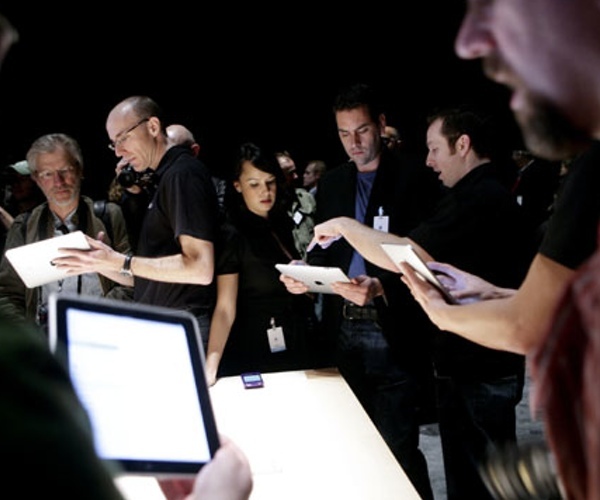 When Apple releases a tablet computer you know it will be awesome. So I bought all those too. A few weeks ago we visited San Francisco. The 9 hour flight from Amsterdam was awful. I’m close to two meters tall and simply don’t fit in those chairs seemingly made for people half my size. We tried to catch some sleep but just couldn’t. When we landed one of my partners remarked “imagine if Apple would make an airplane. What would it look like”. We all smiled. So what if they did? And what if they made kitchen utensils? Or cars? Yes, I would buy them too. Not because I want to make Steve even richer, but because I know they would be superior, well thought out products which would give me lots of pleasure and convenience. Would pay a premium over the same products from other manufacturers? Sure! Sometimes I find myself wishing Apple would branch out into more divers products. Apple chairs? Apple cars? Apple bikes? Apple printers? Apple wastebaskets? Apple underwear? I’d buy it all. The simple fact is that Apple makes high quality products that look good and perform better than any other products in their class. I’m a proud user, am happy to associate myself with that kind of quality and enjoy how it makes my life look better every day.